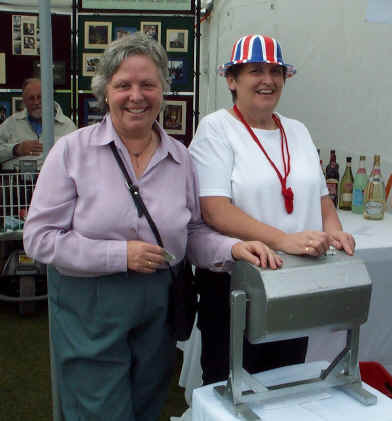 Many organisations came to the Prestbury Playing Fields on Saturday, 7 September 2002 to celebrate the Golden Jubilee of Her Majesty the Queen. Our churches were represented, We held a cake stall and a tombola stall. Also there was a splendid exhibition of photographs taken by the late Rose Davison. The cake stall raised £73 which will be donated to Let the Children Live!, the charity that cares for the children of the streets in Colombia. The tombola raised £271 which will be given to church funds. Although three months after the official date of the Queen’s Golden Jubilee, it did not decrease the enjoyment of the celebration which took place on Prestbury Playing Field on the 7th September. This date was selected because it is the normal time for the annual Prestbury Garden Produce Show and it was decided that both events should be amalgamated. 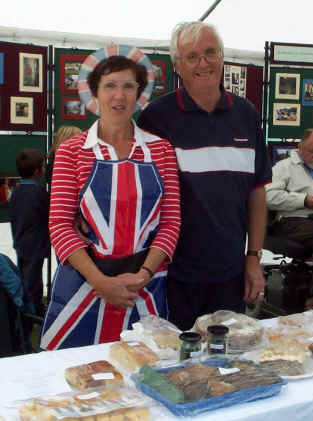 The Prestbury Parish Council, and John Hamey in particular, organise the Prestbury Garden Produce Show and he volunteered to chair the committee for the combined event. The playing field had twenty-five colourfully decorated stalls displaying the skills and wares of local charities and organisations. On display were some lovely photographs of Parish life and some of the well-known houses around the village which were taken by the late Rose Davison. A marquee contained the display of the Garden Produce Show as well as giving cover to two excellent bands called ‘Move It’ and ‘Atalantica’. Their music gave a great atmosphere to the whole day. Mr Malcolm Stennett, Chairman of the Parish Council, welcomed Mr Tony Higgins, the Chief Executive Officer of UCAS, who officially opened the day’s celebration at 12.30pm. UCAS is the largest organisation and employer in the village and generously sponsored the event. A Fancy Dress Competition for children was followed by dancing displays by The Playford Assembly, a group performing Eighteenth Century dances, and a local group of Scottish dancers. The dogs also had their day, as there was a Family Dog Show organised by Laurania Blankenspoor-Williams, one of our Parish Councillors. The Mayor of Cheltenham, Councillor Ken Buckland, proudly presented the prizes and cups for the Garden Produce Show winners and spent considerable time with his wife visiting all the stalls and exhibits. Councillor Barry Lewis enjoyed organising the popular children’s races. A Handbell group from the University of the Third Age gave a delightful rendering of their skills in the marquee and more dancing by the Playford Assembly in the main arena followed this event. Throughout the day the Prestbury Scout Group were offering hot dogs and beef burgers from their barbecue as well as running the skittles and catapult range. Simon from the Royal Oak did a roaring trade with his portable bar from the pavilion dressing rooms. In the main hall of the pavilion, the Women’s Institute supplied Cream Teas to grateful customers in their usual friendly and efficient way. The occasional shower, that sent visitors to the cover of the marquee and pavilion, in no way dampened the enjoyment of the day, and the afternoon finished at 5.30 with lively music from the bands. Everybody, having enjoyed the celebration, wanted to know when the next village event would take place!! !